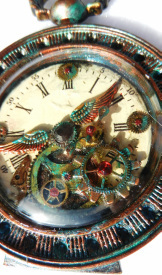 I create handmade Steampunk items with sub-themes of Industrial, Dieselpunk, Bohemian, Pirate, Goth & Victorian styles. Items include cosplay jewellery, bone jewellery boxes, lamps & various types of crafted items from second-hand items such as recycled bike parts, watch & clock parts, animal bones & old cigar boxes. I specialize in the "tarnished" look. Many of my pieces are created by recycling or up-cycling post consumer parts. I also offer fun Rustic Montana Woodland Nature jewelry, all of which are home made and hand crafted. These make perfect gifts for the hunter, hiker, camper or outdoor-enthusiast in your life... or as a gift to yourself! I am happy to do custom orders for individuals, clubs & organizations. Many of my items are perfect for Fantasy and LARP costumes or for Cosplay. I oversee the Facebook Groups - "Steampunk Makers Workshop", "The Virtual Steampunk Tea Party", "The Sublime Sisterhood of Steam" & "The Steampunk Writer's Library" where we talk about Steampunk all the time. I specialize in Fortune Telling with the use of my home made Oracle cards. I quested for about 15 years to find the perfect images, collecting ideas and symbols, so that these cards would speak to people on a deeply subconscious and spiritual level. The resulting deck is a global collection full of multicultural influences. Each of the 33 cards in my deck represent an important dynamic of human life. I try to be at the World Of Wonders Shop on Thursdays 12:15-2:15pm. & all day most Fridays. Saturdays are by appointment only 12:30 to 5:15pm .